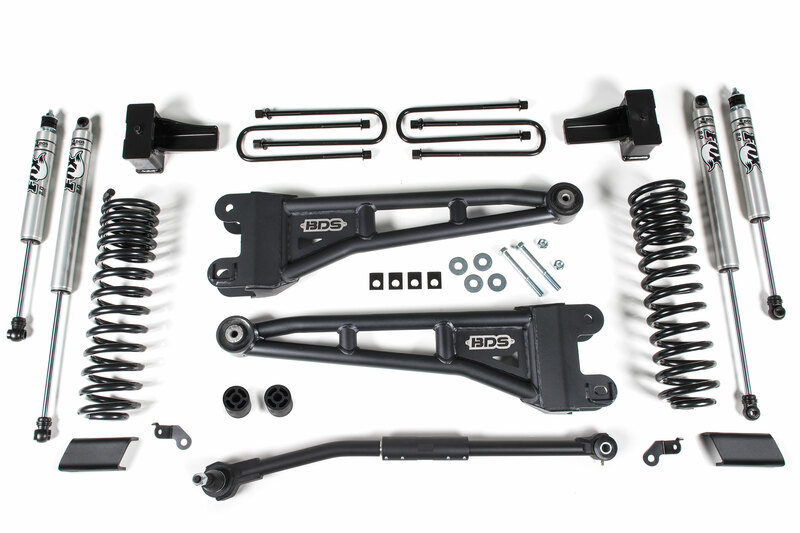 BDS Suspension continues to expand with new suspension systems for the 2017-2019 Ford Super Duty platform. 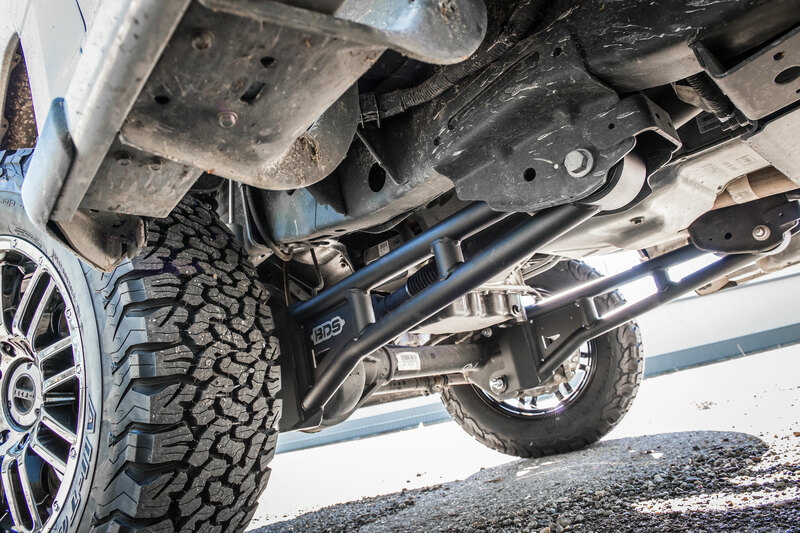 The latest addition to the lineup of 1-8" lift options are new 2.5" radius arm systems designed to improve appearance, strength, and performance with clearance for 35" tires. Based off the widely popular 2.5" kits for the previous generation Super Duty, these new systems include dual rate coil springs, heavy duty radius arms, adjustable track bar, your choice of specially tuned gas shocks and brake line correction along with replacement rear lift blocks and u-bolts to level the stance. As with all kits these new 2.5" radius arm systems for the Ford Super Duty are backed by Factory Protection Plus offering you peace of mind out on the trail or wherever your next adventure may be. This includes a BDS No Fine Print Warranty and a 5year-60,000mile drivetrain warranty. 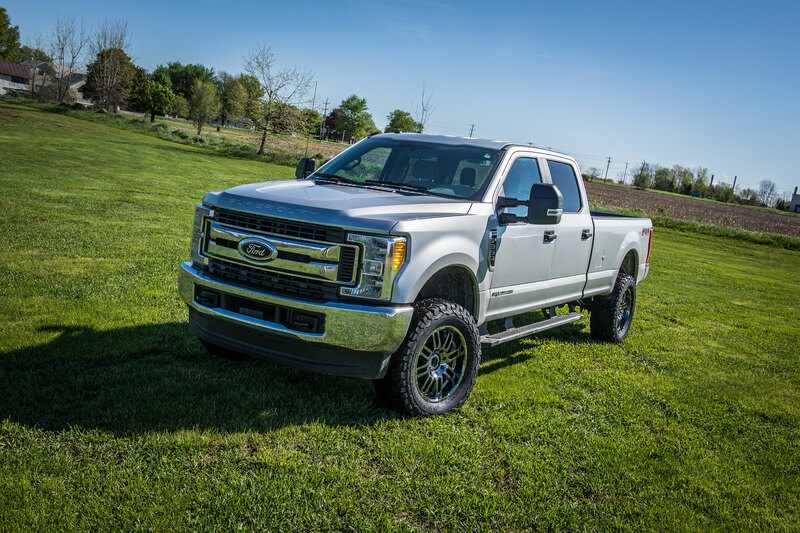 Coldwater, MI: Joining the ranks of BDS Suspension's full lineup of 1-8" suspension lifts for the 2017-2019 Ford Super Duty trucks are now 2.5" radius arm systems designed to provide a modest lift to improve your trucks appearance while improving its strength and overall performance. Designed to allow fitment 35" tires, this system lifts and levels the stance. 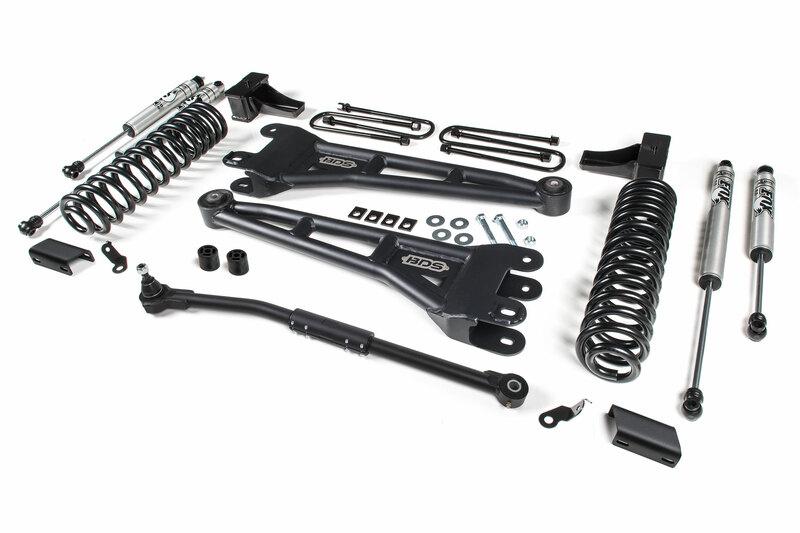 Up front the dual rate ProRide front coil springs are supplied for a comfortable ride and impressive performance on or offroad paired with your choice of specifically tuned BDS NX2 gas or FOX 2.0 performance series gas shocks. In place of the factory stamped steel arms this kit upgrades to heavy duty BDS radius arms built from 1-3/4" OD heavy wall tubing with gussets. These arms feature a large frame mount bushing to isolate NHVs and bolt in place of the stock arms. The heavy wall tubular construction improves strength while correcting axle position by way of lower cam slots to correction set caster at a range of lift heights. Also upgraded as part of these new 2.5" systems is a high strength replacement track bar designed to recenter the front axle with the lift installed. This new bar is built from 1-3/8" solid steel stock with gusseted ends and a fine thread center pinch bolt. It comes pre-assembled and ready to bolt into the factory location to adjust the length. At one end these use a greaseable, high-durometer polyurethane bushing for quiet operation and the other end a heavy duty ball joint. Rounding out the front of these kits are front brake line relocation brackets to allow enough slack in the lines for offroad use. In the rear, these kits use a 4" replacement lift block and new black e-coated u-bolts to net a level stance without the need to stack blocks to do it. These block integrate a rear bump stop wing to correctly limit suspension up travel and allow you to retain the factory rear springs to not effect ride or tow capacity. Matching rear NX2 gas or FOX 2.0 performance series gas shocks are supplied to compliment the front and finish off this kit. 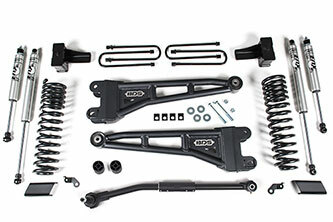 Get your new Super Duty up in the air with this 2.5" radius arm system from BDS Suspension.